Located in the quiet surrounds of Mt Warren Park, our brand new aged caring community is perfectly placed with close proximity to medical facilities and local shops. The easily accessible location also makes visiting your loved ones effortless. Palm Lake Care’s latest family owned and operated Aged Caring Community provides the highest level of residential, respite and palliative care and is affordable to everyone. Applications for Palm Lake Care Mt Warren Park are now being accepted. Mt Warren Park has a hidden surprise. Flowing throughout the community is a subtle provincial colonial theme, complete with ornate wall prints, murals, beautifully styled and embroidered furnishing, and naming inspired by exotic flora, fauna and locations. Inside we have a cinema, library, café, two dining rooms, multiple lounges and brand new suites, all hugging a stunning botanical central courtyard. With dedicated kitchens and a team of onsite chefs, meals will be a major feature of the new Mt Warren Park community. A changing menu has been carefully created by our Executive Chef to maintain the highest levels of nutrition, whilst providing interesting textures, tastes and variation. And of course there’s always a chance for a glass of wine and a little dessert! Moving the body and mind is essential as we get older, so our Lifestyle Team create constantly evolving activity programs to inspire and motivate. A host of facilities are also available, from a grand piano to the library, cinema, onsite salon (because everybody likes a little pampering every now and then) to arts and crafts, and cultural and spiritual activities. If residents already have favourite hobbies, our team will strive to get involved (as long as it’s not skydiving!). The daily experience of each residents is enhanced by the host of leisure facilities and relaxation areas. From the Oasis and Central Park Gardens, to the many little intimate lounges, tucked away throughout the community, all within easy walking distance from every resident’s private suite. The two main dining areas on the ground and first level are the dynamic hubs of our community, but for a quiet cup of tea, a book or catchup over a game of chess, nothing beats a cozy little retreat. Unique to Mt Warren Park is an elegant tropical-themed undercroft Oasis area, open on one side to a lit feature wall and vertical garden screens, and opening out the Central Park courtyard. 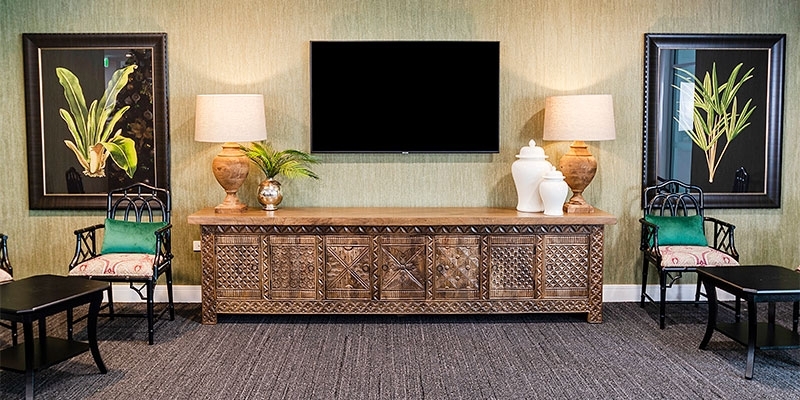 The Oasis promises to be the place to hang out on a warm summer afternoon as cool breezes ripple down from our feature wall and across our internal water fountain. Located to one side of the Oasis is Settlers glass lounge, a cozy den with plush sofas to curl up on while watching the latest movie or game on the big screen TV. 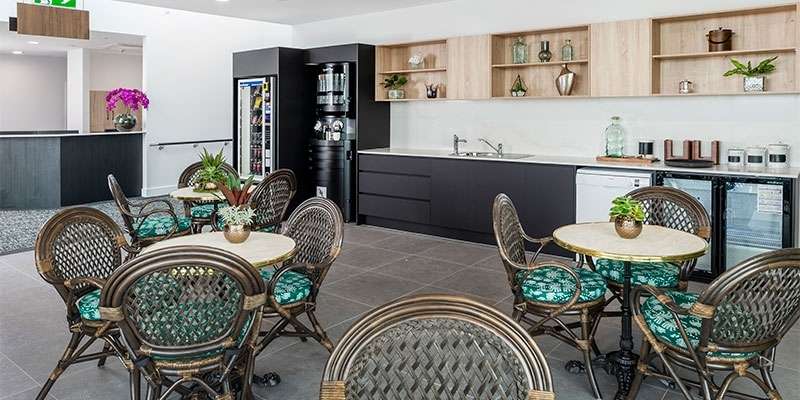 Upstairs at Mt Warren Park is a stylish self-serve café for residents and families to enjoy a quiet coffee or tea nestled into ornate bay window seating. Open anytime. Our sculpted courtyard, known as Central Park, has a combination of relaxing and nature-filled areas that will change with the seasons. Overlooked by The Plantation dining room’s timber soaked verandah and ornamental bubbling fountains, Central Park features a flowering arbour, a vertical garden wall and shady mature trees perfect for an afternoon picnic. Palm Lake Care’s nearby Bethania community features Memory Lanes, a specialised memory support village created around an innovative free-movement concept. To learn more or enquire about vacancies please see our Memory Lanes page. Private suites throughout feature direct access to the outdoors allowing fresh air to circulate and boast the following inclusions. A very nice, pleasant and happy place to reside. Happy staff, happy residents and the food is great, just like home. Keep up the good work, big thanks to all the staff. A very nice, pleasant and happy place to reside. Happy staff, happy residents and the food is great, just like home. Keep up the good work, big thanks to all the staff. All the people are friendly and the food is very nice. I enjoy all the singing and Games. My family helped me move from another care provider and I am so much happier now. Drop us a line or simply freecall 1800 246 677 for new enquiries or call the community of your choosing directly to talk with one of the friendly Palm Lake team.